Key Markets : NYC, Minneapolis, Boston, N.J.
Born out of suburban boredom, the D.I.Y. aesthetic of skateboarding, and an obsessive appreciation for well-crafted pop tunes, Dunebuggy came together in 1991 at the beginning of a seminal time for East Coast indie rock. Having met through skateboarding in high school, singer/guitarist Jon Procopio and drummer Keith Renna began to craft their own original tunes by taking cues from alternative acts such as The Replacements and the Lemonheads. During this time period Jon Procopio also served as a second guitarist in Dahlia Seed. In 1993 the duo added bassist Michael Reilly and that would become the core lineup of the band during it's heyday. Tracy Wilson of Dahlia Seed lent her vocal and writing talents to the band's recordings on a number of occasions. Drawing a heavy influence from Boston (where Procopio attended college) music scene bands like the Lemonheads, Pixies, and the Blake Babies, Dunebuggy focused on becoming a tightly knit unit intent on creating clever indie rock with pop hooks. 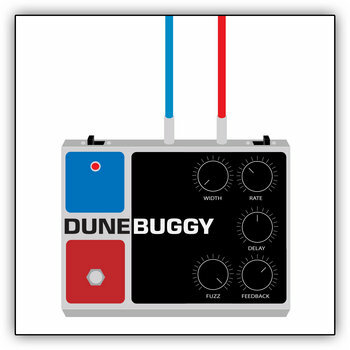 Dunebuggy's sound was punctuated by quirky phrasing, angular guitars, and imaginative lyrics. Based primarily out of Hoboken,NJ, they rented a practice space where they regularly rehearsed and used to record their early singles. They played such 90's NYC staples as Mercury Lounge, Acme Bar and Grill, Brownies, Tramps, and several appearances at Hoboken's own Maxwells. Some of their more memorable live shows were playing with Archers of Loaf , Blonde Redhead, Superdrag, Damon and Naomi, The Apples in Stereo , Papas Fritas, Spectrum, and Air Miami. The band self released two singles, recorded two 7” singles for SpinArt Records in the mid '90s but broke up 1996 without a full length to round out their discography. This posthumous Dunebuggy LP marks the first time many of these songs have ever been heard. Those that have been previously released feature alternate recordings or mixes and all tracks have been freshly re-mastered. The uptempo indie pop songs featured on the album are shrouded in lyrical intricacies and cryptic prose, delving subjects such as insomnia, anxiety, unrequited love, outcasts, Thomas Edison's morality, and a poignant tribute to Minuteman singer D.Boon. The LP is limited to 100 copies on white vinyl. The cover art features a vibrant graphic of a vintage guitar pedal designed by band member Jon-Michael.